Bid adieu to dull, dead layers of skin. Estrella Intenso Lightening Polish Face Scrub With Natural extracts of Corn, Beet Root & Anti-Tan Micro beads removes tan, blackheads and dead cells. It is a corrective treatment that gently exfoliates dead cells and reveals clean glowing skin. It is powered by Tri-Lactiv Technology and promises high-end delivery via safe, potent ingredients sourced and tested from laboratories across the globe. 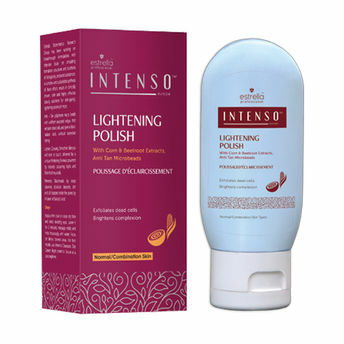 Developed as a professional salon and clinical range used by Skin therapists, Intenso works to improve skin texture, look and feel and overall well being of the skin with regular use. A leading and popular choice among acclaimed skin aestheticians across geographies and the most sought after care regimen among regular salon going customers. Now available to pamper and care for your skin! Explore the entire range of Scrubs & Exfoliators available on Nykaa. Shop more Estrella Professional products here.You can browse through the complete world of Estrella Professional Scrubs & Exfoliators .